Price Tip: If you hate negotiating and still want the best possible deal, always price shop online first. We recommend Car Clearance Deals, MotorTrend, CarsDirect and Edmunds. These free services will offer you the lowest prices on a new Mini and supply you with multiple competing price quotes. You will know the best price before you visit the dealer. Most people mistakenly believe that the Mini Invoice Price reflects what the dealer paid for a new vehicle - The true Dealer Cost. It is not! 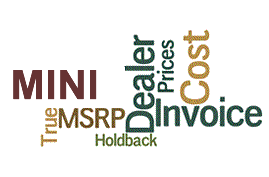 Knowing the dealer cost of a new Mini gives you needed leverage when it comes time to negotiate a great price. Negotiating from the cost up and not the MSRP down can save you thousands on your next purchase. This is the Manufacturer’s Suggested Retail Price, also known as a “Sticker Price,” it is a suggested price from the automaker for the dealership. It differs from the invoice price. The dealer invoice price is what the dealership is billed by the automaker for a vehicle. All dealerships pay a similar amount for the vehicles they purchase from the manufacturers. This price is generally not shared with the customers. The dealer holdback artificially elevates a dealership’s paper cost in order to supplement the dealership’s cash flow while indirectly reducing variable sales expenses, or commission sales. The dealer holdback is often a percentage of the MSRP or dealer invoice that the manufacturer repays the dealership. These are incentives and rebates offered to the buyer from the manufacturer, often when stock is slow moving or a dealership is overstocked. These are fees the dealership must pay for advertising in the region run by the manufacturer. The fee’s are then included in the overall price a car buyer must pay. These fees are typically non-negotiable. This is a fixed fee charged to the dealership from the manufacturer. Essentially it is a delivery fee for transporting the vehicle from the manufacturer to the dealer. Prices vary from manufacturer to manufacturer and sometimes even from vehicle to vehicle within the same company. This amount is often included in the car buyer’s final price. These are offered to the dealerships in order to lower the dealer’s true cost for the vehicle. Often offered regionally, they start competitions between dealerships in order to move slow selling stock. These incentives allow the dealerships to save money on the vehicles they offer. Base MINI Invoice Price + the dealer Invoice price of Options + Destination - Holdback = Total Dealer Cost.